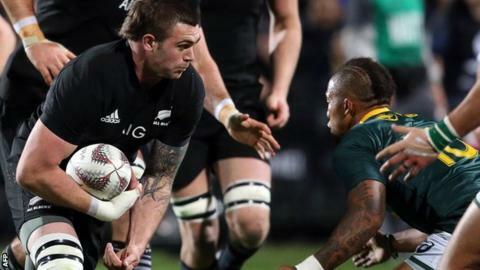 World champions New Zealand ran in eight tries as they thumped South Africa 57-0 in Auckland, their biggest winning margin against the Springboks. Victory extended their lead in the four-team Rugby Championship to eight points with two matches remaining. The All Blacks will secure the trophy for a 15th time by beating Argentina in Buenos Aires on 30 September. In Canberra, Australia scored six tries as they overturned a 13-10 half-time deficit to beat Argentina 45-20. Saturday's match was the second in succession in which the All Blacks have scored more than 50 points against the Springboks, with their 57-15 win in Durban last year their previous biggest victory against them. Despite the one-sided nature of the scoreline, the visitors - unbeaten in their six previous Tests this year - created several opportunities but were met by a resilient All Blacks defence. Rieko Ioane, Nehe Milner-Skudder, Scott Barrett and Brodie Retallick all went over for tries in the first half. Milner-Skudder, Ofa Tu'ungafasi, Lima Sopoaga and Codie Taylor also crossed, with Beauden Barrett kicking 17 points. Tu'ungafasi's try at the North Harbour Stadium in Albany was his first in a Test match. South Africa coach Allister Coetzee said: "I'm very disappointed and the players are hurting. It's not through lack of effort. "It is a challenge for us emotionally. I have great faith that these players will never give up. Never. "We have no option but to fight back in South Africa. We will get stronger from this learning experience." The Springboks face Australia in Bloemfontein on 30 September. Saturday's second match brought together two sides who were without a win in the tournament, and Australia soon found themselves seven points adrift against Argentina. But five tries in the second half took the Wallabies comfortably ahead, with Bernard Foley maintaining a 100% kicking record in his 17-point contribution.